A group of gardening friends who would be willing to grab their pruners, gloves, sloggers and perennial diggers to help each other with projects. My back will never be the same! I've lifted too many Clay and Limestone rocks to have the back I used to have. Now, I try to take the very best care of it and still garden. Lying flat on my back in a neutral position for 15 minutes after every couple of hours of gardening or computing really helps. Ice packs and anti-inflammatory are also my best friends! As for an endless supply of compost and mulch! I will continue to compost all yard waste, mulch leaves and purchase my favorite go to soil improver for clay soil (Mr Natural Complete Landscape Mix). That's as close to endless as I can get! As for the third thing that would improve my gardening life: I've been wishing I had a group of gardening friends like Annie/Transplantable Rose has. She and the other Divas Of The Dirt have been helping each other out in their gardens for the last decade. “Many hands make light work” is an old saying but we’re proving that it’s still a valid concept. A few years ago, we took our artistic and horticultural talents, our muscle power, our varied collections of garden tools, and our Texan ability to shop, and combined all of it to form a landscaping co-op.Since we began working on each other’s garden projects as a team, our individual yards have become more beautiful environments, and we’ve all benefited from the friendships forged through sharing hard work, brilliant inspirations, food & laughter. Some of our meetings have resulted in dramatic garden transformations; sometimes a member was overwhelmed by ongoing maintenance. The Divas have no agenda except to help each other; no laws, just simple guidelines based in courtesy and fairness; no aim but to have fun while we work together. Let us convince you to get out and garden with your friends! Well, Annie/Glinda, you have convinced me. Now to get this group together! In the mean time, I am thankful to have found a group of gardening friends from all over who inspire, encourage, support me every day. You are the best~One might even say, you're superlative. PS Cindy, From My Corner of Katy sponsors Three for Thursday every week. She invites you to share any three things at all. Gail, my Master Gardener group does a Weed and Feed program where we go to another MGs house and help out with the yard work in exchange for lunch. It is wonderful! I am sure you will get a great group together; gardeners are such wonderful people! Dear Gail, Look at your Tommies!! Gorgeous! Now I wonder how much icing you had to do for your back, after planting all those thousand you got in. Your other tiny delicate blooms are so lovely too. I would gladly join your group Gail! I think our distance might be an obstacle though. Not to mention my back troubles . . . we would look funny with our icing after two hours of work! What a great idea though. A win win situation for all involved. Very rewarding in every way. What a joy to see your post/garden this morning, while looking upon a frozen land outside my doors. The contrast is truly wondrous! Delicious light! That is a great idea, Gail! I hope you can get your own group of like-minded dirt divas started. Like Karin, our MGs also does this. It is a lot of fun and camaraderie. It is like a big party day.Good luck finding your group. I admire another group, the Garden Fairies. They go out as a group to make inspiring gardens for others, usually those very deserving and less fortunate. They are a group of artists and gardeners who create the most beautiful places in murals, plants and colorful mosaics. The online support is about as close as I will have to having a garden group too. And supportive, funny, generous and helpful they/ya'll have been...love your Tommies. Good luck setting up your offline gardening group. It does sound like you will all have fun. This is a great idea Gail. I hope you soon find a group of like minded ladies. If I lived closer I would love to be in your group. I have a bad neck that keeps me from doing lots at one time. I plod along. If it weren't for my Dearly Beloved I would not get so much accomplished in the garden. A little help goes a long way. Love the photos of your spring beauties. Gail, while the camaraderie of other gardeners would be wonderful, what about community college students in your area who are taking environment, landscape or horticultural courses? They may find helping you, under your direction, to be a learning experience. Just a thought. Take care of your back. When I was at a computer every day in my tech career, I had two bulging discs that I had to get back into place or end up with surgery. I went to the physical therapist twice a week for a very long time, but he taught me how to do my own stretches to prevent the problem and I'm now pain free. If I can find the instructions (not hopeful about that as I've moved three times), I will copy and email to you. I do yoga several times a week and incorporate my back exercises. Gardening is better for my back than sitting at a desk all day! I am downsizing my garden this year. I'm planting much larger plants/shrubs and self-sowing annuals in the butterfly garden. I'm not adding any new plants this year -- I am only going to add more of the survivors from last year's 90 days of 90+ degrees. Gail, as usual I'm late in posting my own meme ... thank you for such an excellent post! I've been wishing for a group like Divas of the Dirt myself. Shoot, I'd settle for one person! Oh to be young again! I've thought about those Divas many times thinking that it would be fun to be a part of a group like that. I hope you can find your own Divas! If wishes work, you'll somehow find wonderful people who want to garden with you, Gail - although sometimes we Divas of the Dirt joke we're becoming an eating club that does some cooperative gardening to work off the lunches we make for each other. I'm also grateful to the online gardening friends. Life wouldn't be nearly so much fun without you - the friends who are still 'virtual' and the ones met in real life, like you dear Gail! I love the photo of your bottle tree in the background of your Tommies. I have ongoing lower back issues too. Many physical therapists have been supported through my ongoing business! I find a tens unit is my next best friend. I do love Hepatica. I feel like I should be seeing signs of the one I planted last year?? Perhaps I need to add a few more. Such dainty little flowers. Wouldn't THAT be great? Would that I could... :) I could lose myself in your gardens. Love the hepatica! My back is also not what it was, so I feel you. I would offer to help you, but what it oohing and aahing over your flowers, and then taking breaks laying down, lol?! And isn't it amazing how huge amounts of compost fodder decomposes into TINY amounts of compost? I can never ever have enough. I imagine one reason many of us have taken to the garden blogosphere is to at least have the chance to 'talk' together with like minded friends. So far my back is holding up...but my knees...ooooh my knees ;) Gail, if I lived closer, I'd be thrilled to help in your beautiful garden. You are an inspiration yourself. Hi Gail. Great three's. I can so relate to the back problem one from the constant lifting. I wish I had my old back. A support group sounds like a fun idea also. I wish I had some gardening neighbors. Your Tommies are just gorgeous in the sunshine. Divas of the Dirt! what a fantastic idea. My niece recently hosted a permaculture group in her yard and I was envious at how much they accomplished in such a short time. Not to mention all the different ideas that would spring from such a group. Gail, I would love to be a part of some type of group if you formed it. I started following your website b/c I needed to learn about how to garden in Middle TN versus the Mid-West. Working with gardeners like you I would learn so much. Let me know if you pursue this group. I hope you find that group one day, Gail, and I'm glad you're taking care of your back. Well Gail, your group is here in spirit if not physicality. What could be better than claytonia? I love those pink stamens. College students sounds like a good idea.Master gardeners in your area may like your way of thinking. Sorry about the aches and pains, this is when we really need help from others. Sadly over time from hard work I think all our backs are not quite as they used to be. I too agree that it would be very nice if one gardener could/would help another. Seems the task at hand does go faster if more are tackling it. I perhaps have the most. I could bring you some today. Your 3 for Thursda was first rate. I hope you find a great group! If your dedication and good humor relating to blogging are any indication, I'm sure you won't have a problem finding others to connect with in person! Love the Tommies with the bottletree in the background! Sounds like a great idea Gail! We have a garden club here but as far as I know we don't really help each other in the gardens - might be something to try! 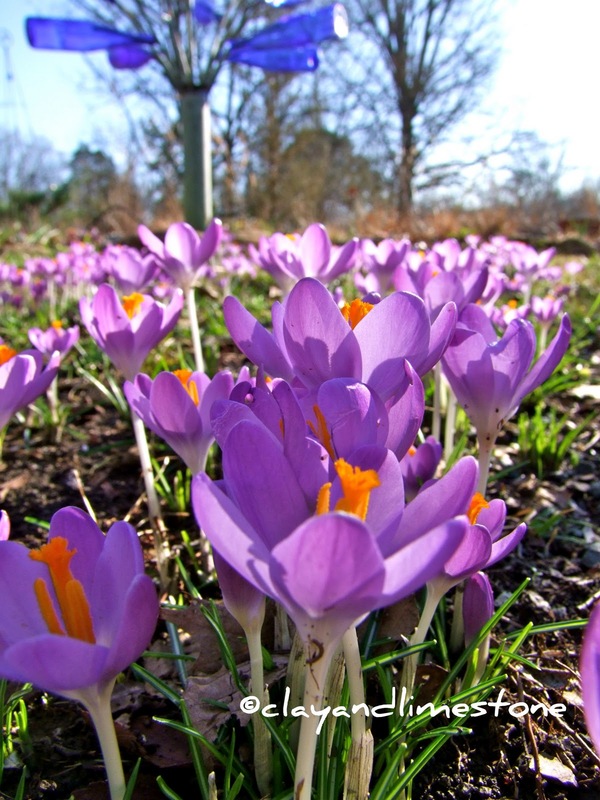 As we get older, it takes longer to recover from abusing ourselves in the name of gardening ... and all the lying around in winter doesn't help things one bit. Working in the garden with friends is wonderful! We don't have a group here, but I do have some rose gardening friends that I trade help with. I have thought about putting together a real group, in exchange for food of course, and this may be just the push I need to take the first step. Your Tommies are spectacular! I am with you on the back thing, having just finished getting my parents place in order for spring, major cut back, clean up, edging etc... I believe the clock says it it almost cocktail time. My neighbors and I have slowly started to get together to help each other. It's really nice. I had a few people ask me questions and next thing you know, we were spending days in each others yards. Gail a fabulous idea! I hear you on the backache...for me it's the aching knees and right hip. Getting down is easy but the getting up...HELP I CAN"T GET UP!!! The same when I try to get those close up macros...the body is not the same...to many aches when gardening. Having a group to share both skills and efforts is a great idea! WEE lake..a woodland garden. I will take notes from all our woodland blogger gardeners for my contribution.Now I'll have to work on having the girls come over to my little woodland garden which I know nothing about..YET. Loved seeing all these images of Spring! BTW Spring has sprung here in the desert so this week should be a great photography opportunity! 1000 crocus?! That was ambitious. They must be lovely whether they are blooming all at once or not. I love Tommies and hope to get them going in the lawn next year. I'm sorry to hear you're having trouble with your back. Pain is so tiring aside from the suffering it causes. I hope you are able to get a cooperative garden club going ~ that would be great for you and other local gardeners. When I moved to Nashville - I so wanted to connect with you. Did not stay long and now in the country surrounded by acres of woods. Beginning a new garden - but I have my computer and continually get ideas from you and love looking at your special pictures. Sorry about the back. Hi Gail, I understand re your poor back. I have an on-going neck problem due to the lifting I do here. I see a cranial osteopathe every so often and use lots of massage oils after gardening. I know I should ease of....but I do not know the meaning of those words and I have a feeling you don't either. Ha! As for compost....I would love an endless supply of leafmould. I always store my leaves but there is just not enough to go around. The woodland area gets most of it. I do compost though and now have nine composters. I have just distributed the contents of five around the garden.......I feel a massage coming on!! 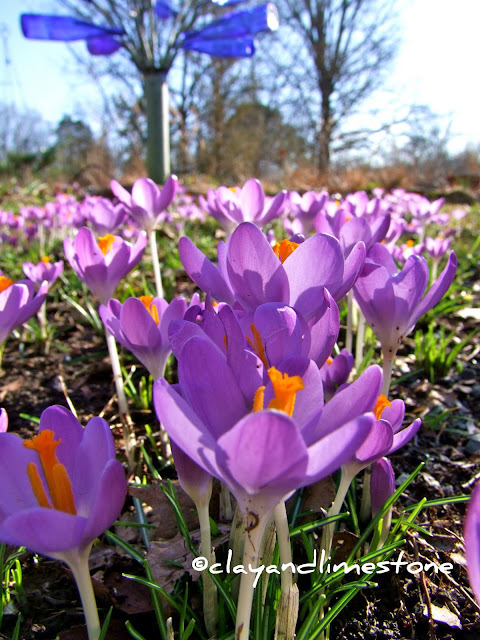 Great post Gail.....and a beautiful photograph of the crocus. Just looking at your spring views was balm to this gardener who is still looking at snow. I definitely would love a more youthful back (and knees). I count myself lucky to have a gardening spouse, so there is always someone sharing the work — except when we come up with special projects that take us off to our own corners of the garden! Your blooms are lovely, Gail. So wish I could see them in person -- and I'd happily come join your gardening group of Divas. The rest of the Austin gardeners usually reserve their cooperative efforts to shopping! It's always more fun to troll nurseries with a buddy to ooooh and ahhhh over the latest garden goodies. Hi Gail. About the "No Right Click' script you can add it into the body of your HTML or the easier way to just add it as a Gadget. Gail you asked about the LA irises ~ I've grown a few cultivars and although I've read that they'll do well in any good garden soil, that has not been my experience. In order to bloom my iris need moisture and lots of it. In a ditch or next to a downspout where they will receive a lot of water. I have 'Sinfonietta' next to the air conditioner drip and it has bloomed for me there, although I don't think it bloomed last year (very dry spring with moderate temps, no AC). My knee sympathizes with your back! In lieu of having my friends come over and help me garden, I conscript my teens. But I do like your idea better! I bet my kids do, too! Beautiful photos! Great idea, Gail. Love the Hepaticas. Hi Gail, I winced in recognition re your back. The "group of friends gardening together" idea is a wonderful one. Here in the UK we have the GROFUN (http://www.grofun.org.uk/) project which is geared to doing that with veg. On the other hand, some people just don't garden well with others. Good luck finding a group of like-minded people to share the fun and the toil with. I hope you find some folks to garden with. I think it would be fun to help in a community garden, but my yard is small, and I don't like others stepping in my flower beds. I'm too possessive of my gardens, and not good about sharing my space. I do share lots of starts of plants, though.